Contenders for the Darwin awards? Imagine this: you work for the Northern Powergrid, replacing wooden electriticy poles across the Cumbrian landscape. Your specific role is driving the big diggers – the power behind the project. You’re wanting to get your digger across the valley to the pole-replacement ground in time to get back home for tea. So why not take a short-cut across that 1000 acres of flattish area you see infront of you? Because …. YOU’LL SINK! That’s what happened when Digger #1 attempted to cross the Butterburn Flow (what a name!) 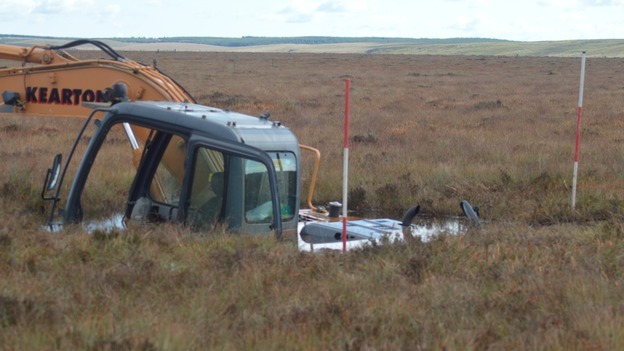 upland peat bog back in September. What’s more, it’s a Site of Special Scientific Interest (SSSI); there were fears that oil leakages and the general disturbance would threaten the ecosystem. Cue Digger #2. Digger #2 went in after Digger #1 on a rescue mission, and guess what? IT SUNK! Two huge diggers stuck-in-the-mud. According to reports, there was a retrieval plan involving a temporary metal road surface, probably more diggers and a lot more people. So they are likely to be out now, but I doubt they made it home in time for tea.